Congratulations… You’ve chosen the right place to have your vehicle repaired. 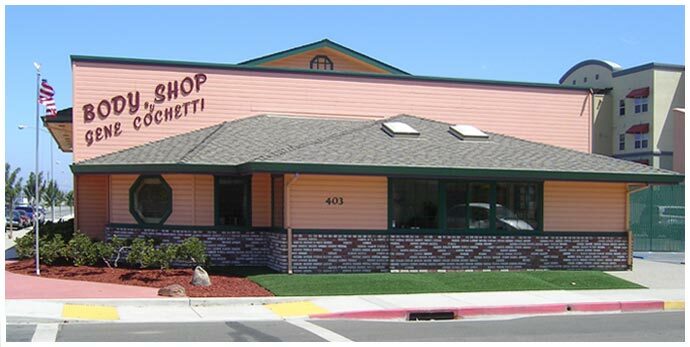 Body shop by Gene Cochetti was founded in 1977 by Gene Cochetti at the same location we are at today. In 1994, we expanded the auto body repair facility to meet the volume demand collision repair in the growing community. In 1990, Gene’s son Chris returned from college to work in the family auto body business. Gene and Chris currently manage the day-to-day operations of the full auto body and collision repair shop. Our full auto body repair services include: auto body repair, collision repair, dent removal, body work, frame repair, fender and bumper repair, auto painting, paintless dent removal, auto refinishing and auto glass replacement. All of our auto body technicians are I-Car certified, and all of our auto paint technicians are trained and certified by P.P.G. Our goal is to return your vehicle to you in the condition that is was in before the accident damage occurred to your car, truck or SUV. We refer to this as pre-accident condition. The way we do this is by using the best equipment, quality parts, and a highly trained staff.